Some people wonder what the fuss about laundry products is all about. What follows is Dr Anne Steinemann’s research on specific chemicals and their health effects. These are not just benign additives. They cause serious harm, and they are accumulating in ourselves and the environment, where they also harm other species. Principal Investigator: Anne C. Steinemann, Professor, Civil and Environmental Engineering, and Public Affairs, University of Washington. Chemicals identified by gas chromatography/mass spectrometry (GC/MS) headspace analysis. Health and regulatory information obtained from databases compiled by the National Institutes of Health, Environmental Protection Agency, and other federal agencies. Note that fragranced consumer products are not required to disclose all chemicals, not even ones classified as toxic or hazardous. None of these chemicals were listed on any product label or material safety data sheet. The above info has been shared with Dr Steinemann’s permission. the links at the bottom of Toxic chemicals in everyday laundry products!?! This entry was posted in Environmental Health, Fragrance, Indoor Air Quality, Laundry, Pollution, Public Health and tagged chemicals in clothing, chemicals in laundry products, environment, fragrance chemicals, hazardous air pollutants, laundry, phthalates, Research, science. Bookmark the permalink. The smells from fragranced laundry products seem to be everywhere now. This is some of the worst for me. Sadly, these aren’t the only toxic chemicals in laundry products. Researchers test by looking for certain substances, but if they don’t know what to look for, they might not find it. I was informed a number of years ago that there were several other quite hazardous chemicals used regularly. This is why so many people are made ill by laundry products, and why we can’t go for walks outside or open our windows when people have their dryers on. Did you notice how all but one are neuro-toxic? Yet products with these and other harmful ingredients are adverstised on tv every 15 minutes, they appear in our email sidebars, as well as everywhere on the internet. Probably in print too, but since I haven’t been able to tolerate the inks and papers in years I don’t see those. Even babies are forced to marinate in this stuff 24/7, from clothing and bedding they have contact with. 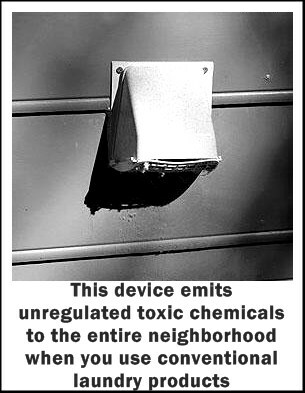 Should be against the law to subject people and the environment to toxic chemicals on a daily basis!!! I began being sensitized due to TIDE. I plan on suing Proctor & Gamble as my life is destroyed. We need a few good lawyers willing to stand up for health. CORRECT!!! I will be filing a lawsuit. Anyone want to join me in a class action lawsuit??? Thank you for sharing this truly disturbing information! People need to know!